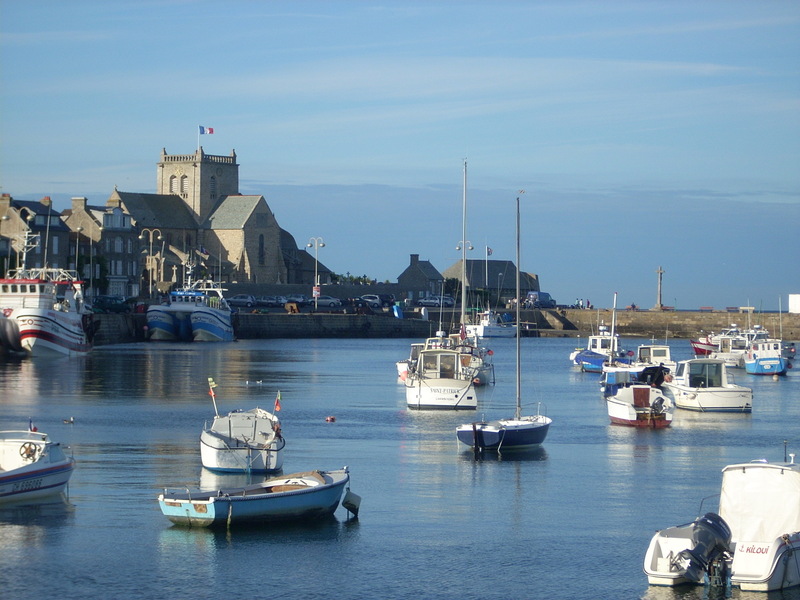 The late afternoon sun is gorgeous—warm and low in the sky— and the vibe of Barfleur is that of “le long weekend.” With Bastille Day tomorrow, you can feel an unmistakably French holiday pace. At the harbour, a couple sits on their moored boat, quietly sipping drinks, not even talking. Families and older couples stroll along the jetty while small boats, their hulls thickly painted marine green or cobalt blue, bob next to the concrete pier. Sitting on a bench with my back to the sea, I bask in the flush of the sun as it begins to signal that even this long summer day will wane before too long. “Bouff!” — the couple on the bench next to me uncorks a bottle of wine. Ringed by small houses, a dated carousel, and shops, the harbor is anchored by the squat stone church whose deep bell rang out earlier. Small craft, crabbing boats, motorboats, and skiffs salt the harbor, under the gaze of a small lighthouse. A cross of Christ crucified looks out to sea, keeping watch against the English . . . just in case. Several noisy motor-scooters disturb the peace, but the man sitting on the bench next to me–now sipping his wine and eating a cracker–sighs contentedly. 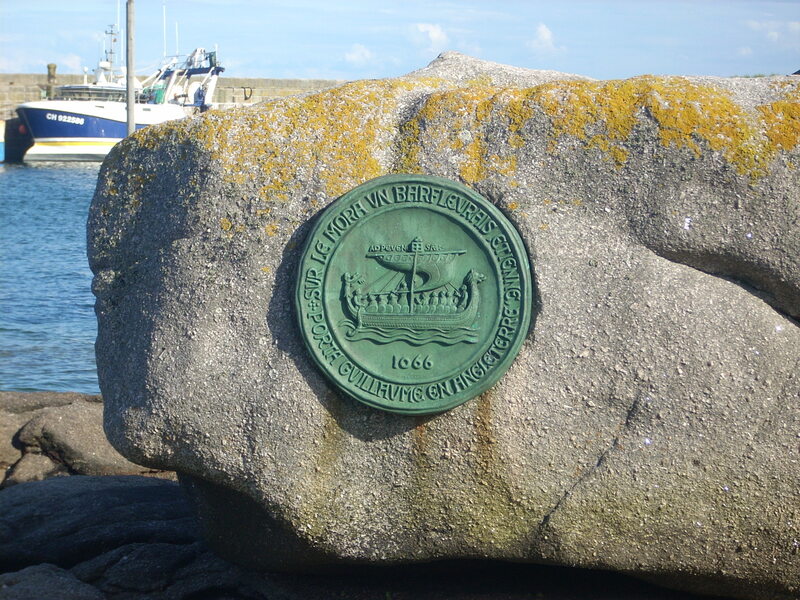 Affixed to a mossy rock near the sea wall, a green-tinted copper medallion organically commemorates the Norman Conquest of England in 1066. Did this large rock protrude out of the water here in 1066 or, at least imaginatively, when Arthur and his troops landed in the uncertain, waning days of the Roman Empire? In a scene depicted on the Bayeux tapestry (see earlier post 1066! ), William the Conqueror’s men felled trees here at Barfleur to build the ships for their journey to claim England. The tale of King Arthur’s continental campaign offered English readers a literary reversal of the Conquest and an affirmation of English sovereignty. Small wonder it was such a popular story with English readers from the twelfth through the fifteenth century. By the mid-fifteenth century, spiked with fresh rancor caused by the Hundred Years War between England and France, it was good reading indeed. In Malory’s tale, Arthur held his parliament in York on January 21st (the utas of Seynte Hillary), then marshaled troops along the shore of Sandwich a week or so later (Redy on the Banks). By now in the narrative, it is bone-chilling February as Arthur and his army mass here for the campaign. Then, perhaps a bitter cold and rain; now, a lush afternoon sun and a light coastal breeze. It’s good to be following the summer version of the Roman War campaign itinerary. Gallery | This entry was posted in Uncategorized and tagged Barfleur, King Arthur, Meg Roland, Roman War, Thomas Malory. Bookmark the permalink. it is good to remember those cold days of Feb from a warm bench in the sunshine. It allows us to see clearly the paths ahead – and those behind.